This post is a travelguide about backpacking Montenegro including a 2 week Montenegro itinerary with the best things to do in Montenegro for independent budget travellers. A few years ago I read in Lonely Planet’s magazine about Kotor being the top destination for that year. Since then I wanted to go backpacking Montenegro, a country that only got its independendence in 2006 after a peaceful referendum. It sounded like a magical place in an unexplored region and started planning my Montenegro itinerary. But I was not the only person that had read this. Kotor is no longer the hidden gem it once was and Montenegro is quickly developing to become the Monaco of the Balkans. Luxury yachts and throngs of beach tourists dominate the coast in summer. It is rightly popular, but the best things to do in Montenegro are beyond the coast. Why Montenegro is the perfect destination for backpackers? Kotor might have been too crowded for my liking, but Montenegro did not fail to impress me. With most tourists sticking to the beach, it is not difficult to find more quiet and off the beaten path places. And as beautiful as the bay of Kotor might be, it gets even better when you travel inlands. For nature lovers there are plenty of things to do in Montenegro and there are no less than 5 National Parks. The Montenegrin name of the country is Crna Gora which means black mountain and the rocky hills dominate the landscape. Pockets of virgin forests are the home of bears, wolves and deers. I came for Kotor, but found a wild beauty with incredible nature. Montenegro is maybe not the cheapest country in the Balkans, but it is very well possible to stick to an average backpackers budget if you travel with public transport and stay in budget accomodation. I have included more tips how to keep things cheap in Montenegro at the end of this post. Backpacking Montenegro is well worth the effort. The only regret I had was that I did not plan enough time in Montenegro. I stayed for a week and based myself in Kotor from where I did several exciting day trips. If I would come again I would not only spent more time in Montenegro, but I would also spent more time inland to explore Montenegro’s National Parks. This post will show you a 2 week Montenegro itinerary with the best things to do in Montenegro. Hopefully this will help you in making your own personal Montenegro itinerary. My Montenegro itinerary started in Podgorica. Montenegro’s capital is not at all representative for what the country has to offer. It was one of my least favourite cities in the Balkans and I did not find any reason to spend much time among the grim-looking Soviet flats. However, there is actually one reason to include Podgorica in your Montenegro itinerary and that is the daytrip to the Ostrog monastery by train. Podgorica offers one of the cheapest and most adventurous ways to visit the Ostrog monastery. A must visit on your Montenegro itinerary. The monastery is perched on a cliff 900 meters above the valley below. Even though the view is enough reason to visit, most people come in search for miracles. Thousands of pilgrims of different faiths believe in the power of Saint Basil. Stories abound of unexplainable cures and spiritual inspirations. The relics didn’t do much for me, but nevertheless it was a beautiful serene place. I left impressed by the devotion of the visitors and the stunning location. Logistics: From Podgorica there are seven daily trains to Niksic that stop in Ostrog. The journey takes 45 minutes and costs less than 2 euro. From the train station it is a steep hike up the mountain (1 – 2 hours). Kotor is probably the reason for many people to add Montenegro to their Balkan itinerary. The charming old town of Kotor gets more busy every year up to the point you might wonder whether Kotor is still worth visiting. Despite the amount of tourists, Kotor remains one of the best places to visit along Montenegro’s coast for the independent budget traveller. Amidst the luxurious boutique hotels are some cheap backpacker hostels like Old town hostel , Pupa hostel & Montenegro hostel. Kotor’s old town is still a beauty and there are enough things to do that keeps you busy for a day or two. Strolling through the narrow streets with the old stone houses, walking up the fortress to see the view and visiting the cat museum are just some of them. In addition there are some great day trips that are easy to arrange from Kotor. The old town hostel offers the Great Montenegro tour and the North Montenegro Tour. If you have limited time I can recommend them. They are professional and you get to see Montenegro’s highlights in only two days. However, with most places I wished we had more time and it is not too difficult to visit them on your own. In this 2 week Montenegro itinerary I will explain how. Logistics: Kotor has frequent buses to Niksic, Cetinje, Budva and Podgorica (1 – 2 hours). There are also buses to Zabljak for Durmitor NP (3-4 hours). Cetinje is the historical and cultural capital of Montenegro where the Petrovic royal family ruled the country for centuries. Some of their palaces are still there and so are several museums that will teach you more about Montenegro’s rich past and traditions. Cetinje is the best place to visit in Montenegro to learn more about the country’s past. It is a small town with a pleasant boulevard and a historical center. The ancient Serbian orthodox monastery is also worth a visit. The frescoes inside are beatiful and it is home to several relics such as the right hand of John the Baptist. Cetinje is located at the foot of Mount Lovcen. From Cetinje it is easy to arrange a trip by taxi to the Lovcen Nattional Park and the mausoleum of Negos on top of the mountain. The early 19th century political leader, philosopher and poet played a big role in Montenegro’s history. The mausoleum was built in his favourite place. The peak of the Jezerski mountain. The views are amazing and on a clear day you can see almost all of Montenegro. It is easy to recognize Kotor bay and Skadar lake. Logistics: Take a bus to Cetinje and from there you can negotiate a taxi to Lovcen NP (20 euro with waiting time). There is more to the bay of Kotor than Kotor town alone. If you want to get away from the party scene and all the tourists there are some beautiful and quiet places in the bay of Kotor. One of my favourite places to visit at Montenegro’s coast is cute little Perast that overlooks a monastery on an island. If I were to come back to the bay of Kotor I’d rather stay here then anywhere else in Montenegro. It will probably be difficult to find budget accomodation in Perast, but if you want to escape the crowds it will probably be worth it to spend a bit more. Logistics: Perast is 20 minutes away from Kotor by bus. Montenegro’s coast offers charming old towns with majestic mountains in the background. The scenic bus rides between the towns offer stunning views on the blue ocean. Personally, I found the journeys more spectacular than the towns itself. Beautiful as they might be, they are also extremely crowded. The modern ports of Budva and Bar were uninspiring with resorts, souvenir shops and the typical beach tourists. You will have to make a bit of an effort to find beauty here, but in Montenegro it is never far away. From Bar you can walk an hour up the hill to the fortress in Stari Bar. The old town was once one of the most important settlements in Montenegro, untill it was destroyed by an earthquake in 1979. The new town was built down the mountain. It’s only in recent years that renovation work has started to bring back the ruins to its former glory. Near Budva is Sveti Stefan, one of the most photographed places in Montenegro. The fortified island with the old 15th century town villas is now owned by a resort. Only guests can enter the island through a narrow causeway. Logistics: Between Kotor, Budva and Bar are frequent buses (less than 2 hours). Durmitor National Park was one of the highlights of my Montenegro itinerary. For mountain lovers like me there are more than enough things to do here. I can really recommend to stay at Durmitor for a couple of days. There are plenty of organized day tours from the coast, but you will only see the tip of the iceberg. It’s easy to visit the park on your own and Hostel hikers den in Zabljak will help you to explore some of the spectacular trails. For example, the hike to the highest peak Bobotov Kuk. Check this excellent guide from Sandy feet for tips and advice. Then there is the 10 kilometer hike to mountain Curevac at the edge of the Tara canyon. Check the guide from Traveltramp for that one. If that all sounds a bit too much for you, there are also easier hikes to the beautiful lakes that dot the landscape. The most famous lake is the black lake that is only 3 kilometers from Zabljak. The glacial lake surrounded by pine forests has a 4 kilometer trail around the lake that takes between 2 and 3 hours. 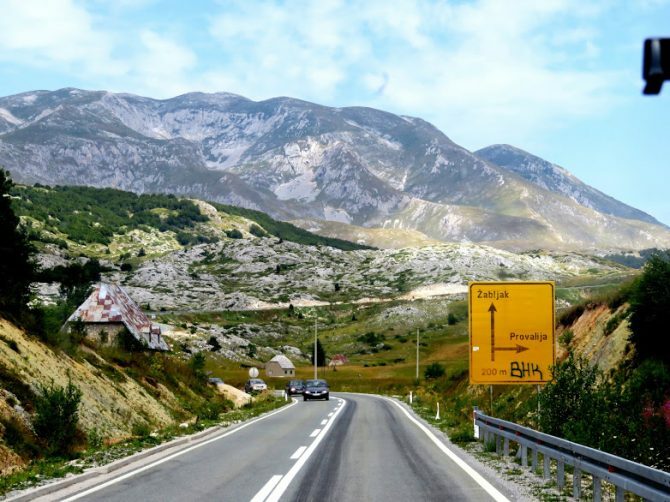 From Zabljak it is also an easy day trip to the famous bridge over the Tara gorge, the deepest gorge in Europe. The view is enough reason to come, but if you love adventure there are enough things to do at the Tara Gorge like rafting and ziplining. Another highlight of my Montenegro itinerary was Lake Skadar. It is one of the best places to visit in Montenegro for nature lovers. Skadar lake is not only the largest freshwater lake in the Balkans, but also the largest national park in Montenegro. With more than 260 different bird species it is a great place to go birdwatching. However, with a bit of luck you might also see some other wildlife like deers or wild boar. From the small town of Virpazar you can organize boat excursions, birdwatching tours, kayaking, hiking and cycling tours with either Lake Skadar Adventure tours or Tourist Agency Outdoor and more. The town also gives you an insight into Montenegrin life away from the tourist crowds with excellent guesthome’s and restaurants. Logistics: Virpazar is on the main train line from Belgrade to Bar. From Podgorica and Sutomore there are frequent buses to Virpazar (less than 1 hour). Virpazar has several accommodation options starting from 15 euro per night. Montenegro is a small country and you might wonder if it is even possible to spend more than two weeks there. My answer is absolutely yes. If you have more than two weeks there are many places you can add to your Montenegro itinerary. First of all, there is the Biogradska National Park that is on the way from Belgrade to Podgorica. This park is home to several glacial lakes and one of the 3 remaining rainforests in Europe. There are six well marked hiking trails to different peaks and trails. The nearest towns to the entrance of the park are Mojkovac and Kolasin. The bus from Podgorica to Mojkovac takes about two hours. Meanderbug has an excellent post about the best places to stay in Biogradska Gora. Prokletije National Park at the border with Albania and Montenegro is a bit more difficult to get to for backpackers, but is a great addition to your Montenegro itinerary. There are several entrances, but the visitors centre is in Gusinje while most accomodation options are in Plav. From Podgorica there are 4 buses a day to Plav (4 hours) and Gusinje (4,5 hours). The most exciting way to get to Montenegro is by taking the famous Belgrade to Bar train. This journey crosses the Dinaric Alps and is one of the most scenic train journeys in Europe. Summers in Montenegro are hot and crowded, especially along the coast. This is the peak season for tourism and almost everywhere you go in Montenegro it will be busy. The best way to escape the crowds and the heat is to head inlands and explore Montenegro’s mountains. Summer is the best time to go hiking. Montenegro is a small country and almost all of it are mountains. There is no shortage in hiking options and there are several hiking trails avbailable in Durmitor National Park or Biogradska Gora National Park. If you want a more quiet experience in Montenegro, the best time to visit are spring and autumn. Both offer pleasant temperatures and either blooming flowers in spring or autumn colours. There are not that many tourists around, but towns are still lively. This means you will have a more authentic experience in Montenegro. Winters can get cold and snow in the mountains can make it difficult to travel around. In the coastal towns many things close down and as crowded as they are in summer it is the opposite in winter. It won’t get more quiet than this, probably a bit too much. Still, Montenegro is a perfect destination in winter for those that love wintersports. Kolasin and Zabljak become the best places to go skiing. Other options include winter rafting in Tara, snow mobiling or hiking through a winter wonderland in Durmitor. Even in winter, Montenegro is well worth a visit. Montenegro uses the Euro and is one of the more expensive destinations in the Balkans. Prices in Kotor are similar to prices in Western Europe. However, there are several ways to keep things cheap. Another reason to visit in spring and autumn is that it is low season and prices will be slightly lower. Also the more inland you go, the cheaper things will be. I hope that this guide has convinced you that the inland is definetly worth it. On top of that you will get more value for your money. Travelling on a budget is very well possible in Montenegro. There is a good public transport network with frequent buses between the major towns of Podgorica, Cetinje, Zabljak, Kotor and Budva. Durmitor and Skadar NP are easily accesible. Only the National Parks of Lovcen, Biogradska Gora and Prokletije require your own transport. Another tip is to eat like the locals do. Go to one of the traditional bakeries and buy yourself a burek with yoghurt for breakfast. The pastries are filled with cheese, meat or spinach and are a perfect start of the day. Every town also has a fresh farmers market where you can buy fruits and vegetables. Cevapcici, the balkan version of kebab, is a cheap take-away snack that is easily available. If you want to eat out get away from the restaurants for tourists and see where the locals go. It will be cheaper and the food will be better. For cheap accomodation there are hostels in Podgorica, Zabljak, Kotor and Budva. Otherwise look for the sign ‘sobe’. These are people that have a room available in their house. Airbnb also has some cheap options. This is such a cool piece! Makes me want to go to the Balkans even more than I already do! I’ve never been to Montenegro but I’m excited after seeing your pictures! It looks like such a beautiful country and an underrated destination! Thank you for sharing! What a beautiful country! I am adding this to my wishlist. Loving this post! And absolutely agree regarding the season. We will be traveling to Montenegro in the beginning of September and now, while making all arrangements, can see how much prices for accommodation and transportation drop. Your photos are amazing! I want to travel to the Balkans soon. It’s such a fascinating area of the world, and so overlooked! Looks nice spot to spend some time in nature. Looks beautiful & have Montenegro on my list to visit. Sounds like I need to go soon though as no longer a “hidden gem”. Thanks for sharing – really comprehensive. We have looked at driving through this region en route to Greece, although looks worthy of exploring and not just passing through. We are planning on visiting there within the next year or two so this was great to read. The scenery looks stunning. Thanks for sharing.